These are provocative statements given that the authors he lists have generated scholarship that has spawned productive research agendas in numerous areas of international politics from the study of international organizations, to NGOs, to human rights and security. 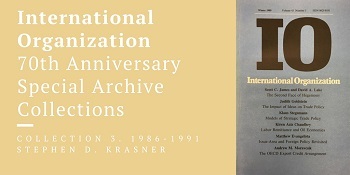 Let’s explore Krasner’s claims that research on nonmaterial factors is “not robust” and “absent” in international relations. One way to measure the robustness and impact of scholarship is to examine citation counts—a controversial yet practical indicator for measuring the diffusion of theory and concepts. Martha Finnemore and Kathryn Sikkink’s “International Norm Dynamics and Political Change,” which was published in IO, has been cited 5,621 times according to Google Scholar. Finnemore and Barnett’s “The Politics, Power and Pathologies of International Organizations,” also published in IO has been cited 1,608 times in Google Scholar. According to Google Scholar, Kathryn Sikkink’s work has been cited 30,109 times while Krasner’s has been cited 27,854 times, and Haas has been cited 17, 160 times. Margaret Keck and Kathryn Sikkink’s Activists Beyond Borders shaped the entire research agenda on the study of non-governmental organizations (NGOs) in international relations and has been cited 10,842 times in Google Scholar. My NGOs in Global Politics syllabus is based on the research agenda generated by Keck and Sikkink’s book and numerous scholars have published articles in IO refining and expanding upon the concepts and theoretical components advanced in Activists Beyond Borders including Amanda Murdie and Alexander Hicks, Dongwook Kim, Lisa Sundstrom, Charli Carpenter (also here and here) and Tim Büthe, Solomon Major, André de Mello e Souza. 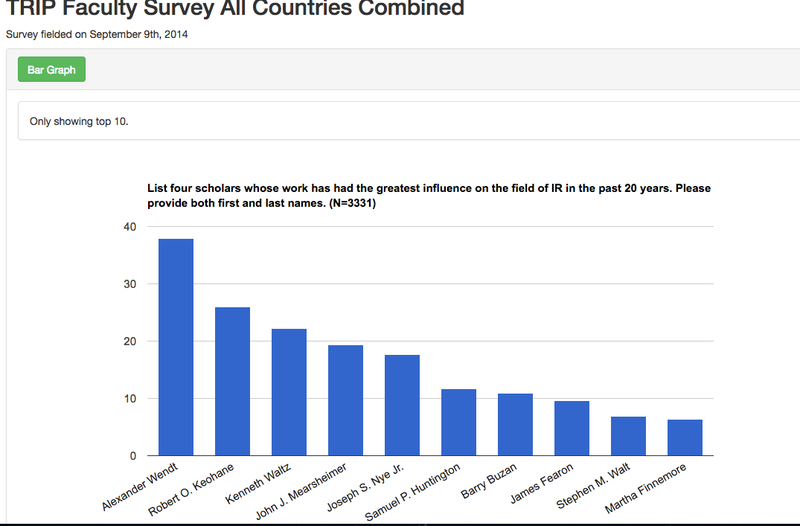 Data for all countries combined include both Alexander Wendt (first) and Martha Finnemore (tenth) among the top 10 scholars in the field. Notably, Martha Finnemore is the only woman to appear on this list. 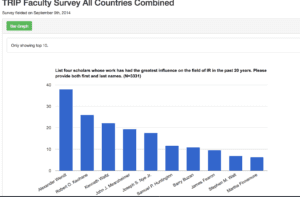 Examining the data for U.S. respondents only, Alexander Wendt remains in the top spot and Martha Finnemore moves up to ninth place—she remains the only woman noted. The results here are interesting and contradict Krasner’s speculations. 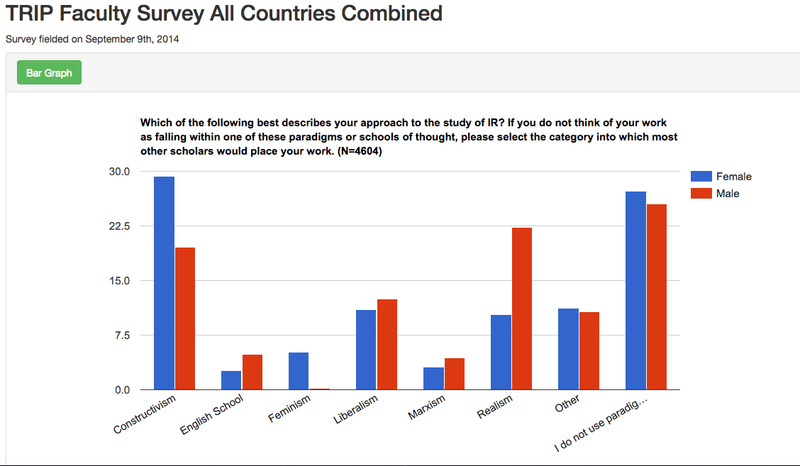 22.62% of scholars indicate that they use a constructivist approach, while 18.33% and 12% say they use realism and liberalism respectively. 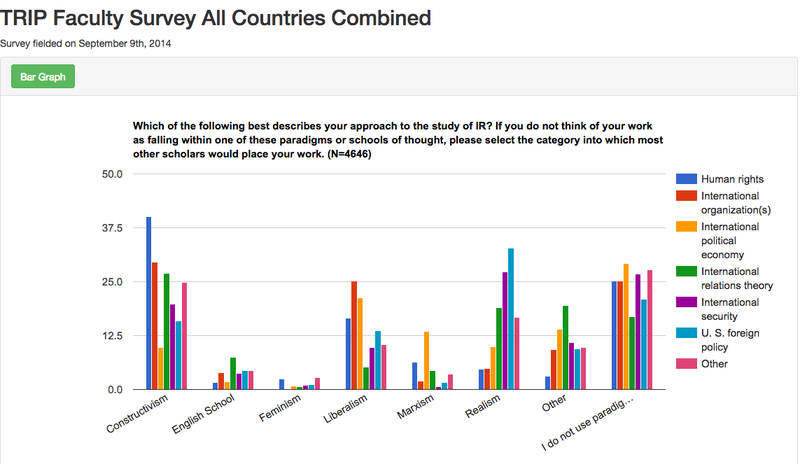 So, more scholars use constructivist theory, it is perhaps just not published in IO. If we disaggregate the data by issue area, interesting trends emerge. 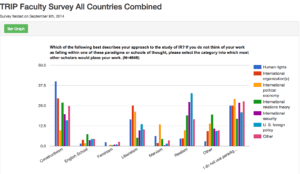 If we accept Krasner’s claim that IO is mostly concerned with International Political Economy (IPE), then we should expect to see more publications using liberal/rationalist (material) approaches as 21.19% of those who claim to use liberal approaches also say they study IPE compared to 9.71% of constructivists and 9.93% of realists. Some, myself included, would disagree with the claim that IO should be mostly concerned with IPE and would argue it should instead cover topics in international organization and global governance including human rights. 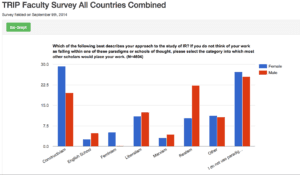 In the TRIP survey, 29.61% of constructivists say they study international organization compared to 25.24% of liberals and 4.85% of realists. 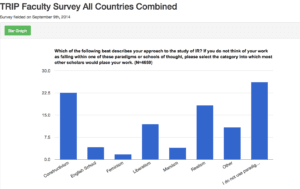 The largest number of constructivists, 40.16%, say they study human rights, compared to 16.54% of liberals and 4.72% of realists. Again, if IO privileges publishing research on IPE or if scholars perceive IO to be more interested in publishing articles on IPE (and thus do not send their manuscripts on other topics to IO) this would affect publication patterns. If we disaggregate the data by gender, there is a possible explanation for the “absence” of research on nonmaterial factors that Krasner claims. 29.34% of constructivists identify as women while 19.56% identify as men. 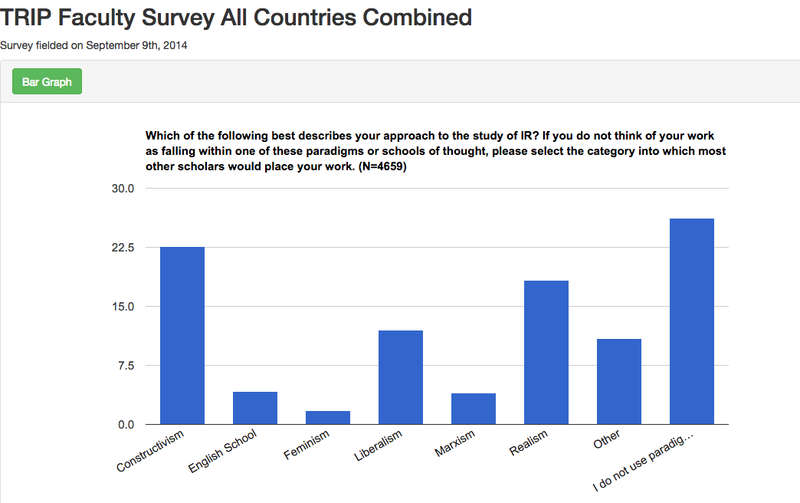 By contrast, 22.3% of realists identify as men and 10.36% identify as women. Daniel Maliniak, Ryan Powers and Barbara F. Walter’s the “Gender Citation Gap in International Relations,” published in IO, suggests that women are systematically cited less frequently than men in international relations. If women tend to use constructivist paradigms more often than men, this could in part explain the “absence” of scholarship on nonmaterial factors that Krasner purports. Perhaps because of the dominance of economics in American social science or perhaps because of America’s own underlying belief system, which is so focused on economic opportunity (perhaps itself a myth) and openness, the causal impact of ideational, nonmaterial factors, whether scientific knowledge or religious convictions, have not been as deeply explored as material factors. His focus on the “causal impact of ideational, nonmaterial factors” is the wrong yardstick for measuring the influence of the constructivist research agenda as most constructivists do not claim to demonstrate causation but constitution with the understanding that structure and agency are mutually constitutive. If IO privileges publication of positivist, causal research over non-/positivist research that theorizes the constitutive effects of nonmaterial factors, then we should expect an absence of this type of research in the journal as it is not the right “fit” for neither the author nor the journal. Wow, there is so many crucial points in this article. Thanks for that.